If you have not heard of the Pew Research Institute, it is a non-partisan organization based in the states that does research, demographic studies and public opinion surveys. With the myriad of sources of research that are available, Pew is recognized as one that is both thorough and reliable. Their Internet Project has been ongoing since February 2000 with several hundred released reports. It is no wonder that most “internet use” infographics cite Pew as the source – I have even created a few in this post to add to that collection. 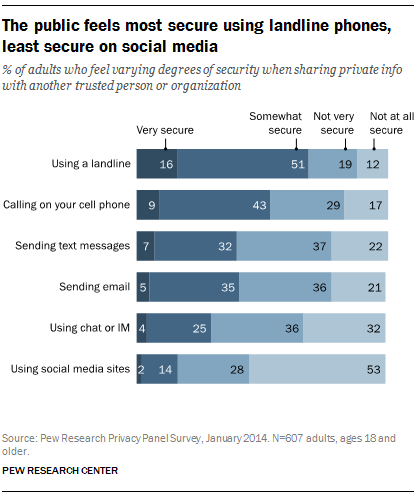 Pew recently released their finding on Public Perceptions of Privacy and Security in a post-Snowden Era. I have summarized the results below. 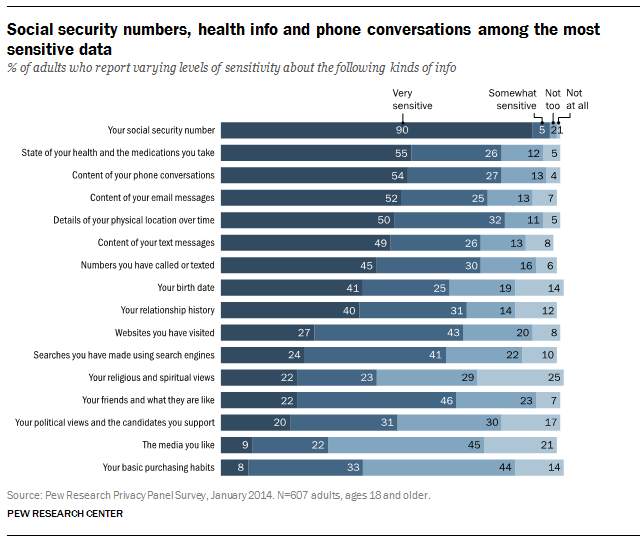 Note that this does not detail the actual state of privacy, but rather this captures the way people perceive it. How do you feel about “Big Brother”? Since digital communication and data are so easily monitored and stored, it is a gold mine for governments wanting to track their citizens – and those that may do their country harm. Last year’s revelation by Edward Snowden was that the government was collecting all of this information without people’s knowledge. What about the methods used to transfer it? How do people feel about using email vs phones? My primary objective as a company is to teach people about what their digital identity looks like and how to shape it in a positive way. A great part of that is understanding what other people can find out about you. 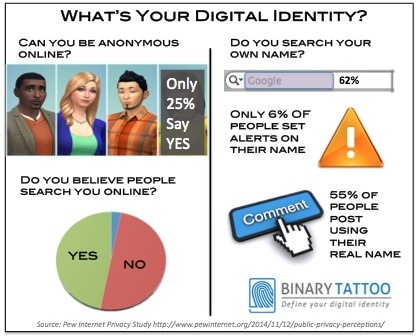 Over half the people surveyed said they used their real name when posting and only about a quarter felt they could be totally anonymous online. That means that most people agree that your online identity is traceable back to you and therefore searchable. How sensitive is your shared information? You always have a choice in what information you chose to share online but more and more people seem to be giving out small clues about themselves without realizing: announcing they are going on holiday, posting that they are selling their home, checking in to places they visit.